By Sean Jones: Errol Spence Jr. boxed his way to a 12 round unanimous decision win over Mikey Garcia last Saturday night to pave his way to what could be a much stadium level encounter against Manny Pacquiao in a unification match in July. Pacquiao (61-7-2, 39 KOs) has already agreed to the fight with IBF welterweight champion Spence (25-0, 21 KOs), and now all that needs to happen is for the fight to be negotiated with the signatures. This was an interesting match-up on paper with boxing’s best welterweight in Errol Spence fighting the sport’s best lightweight in Mikey Garcia. Invariably when you have two fighters that are the best in their respective weight classes, the bigger guy will win more often than not, which is what the case was last Saturday night. With Garcia coming up 2 weight classes, it was too much to ask for him to get the ‘W’ against Spence, who is more like a drained down junior middleweight than a true welterweight. Spence not only threw over two and a half times more punches than Garcia, but he also had a lot better accuracy on his shots in connecting on 32% compared to Garcia’s 18%, according to CompuBox. Many of the rounds were clear Spence rounds. Garcia looked like a deer in the headlights much of the time in the last half of the contest. Once Errol was told by his trainer Derrick James to start walking Garcia down in the ninth round, it was no longer a competitive contest. Garcia was just looking to survive once Spence started unloading on him. One got the sense that Garcia looked like he was overmatched at that point in the fight. He didn’t looked bad like some of Spence’s past opponents like Chris Algieri, Carlos Ocampo and Lamont Peterson, but he was dominated just the same. Garcia lacked the tools in his toolbox to hold Spence off of him. Garcia had the heart of a lion in staying in there with Spence, but he didn’t have the offensive tools to match-up once the IBF champion turned up his offense to high gear. As for Garcia (39-1, 30 KOs), he can hold his head high for putting in a great effort against a guy that was too big for him at the end of the day. Spence, 5’9 1/2″ had the size, power and the hometown advantage over Garcia, and that was enough for him to coast to a 12 round decision win by the scores 120-107, 120-108 and 120-108. Garcia fought as hard as he could, but he didn’t have the size to match up the taller and heavier Errol. Garcia looked extremely talented last night in picking off Spence’s best shots, and firing back punches that clearly got his attention. The problem that Garcia had was he couldn’t throw enough hard leather back to keep Spence off of him for any length of time. Mikey was throwing one shot per four of Spence last night, and he wasn’t going to win being outworked by such a wide margin. Spence’s trainer had done his homework in seeing that Garcia can be beaten by being outworked. Despite moving up two weight classes without the benefit of a catch-weight handicap, Garcia, 31, showed that he had punching power to compete with Spence. What Garcia lacked was the height and reach for him to deliver his bombs on a consistent enough basis for him to win rounds. What Spence showed is that it helps to be the bigger fighter in boxing. Had the two fighters been of equal size, Spence might have had to switch to another fight strategy for him to win. There was nothing wrong with Garcia’s punching power. In boxing terms, Garcia if a freak of nature with his punching power. He hits so hard for a fighter, it’s hard to believe that he started his career out at featherweight. Some of the shots that Garcia was hitting Spence with last night was causing him to freeze momentarily. If Garcia had been able to land more punches last night, Spence would have had problems. Garcia didn’t lose the fight for lack of power. He lost because he couldn’t land enough of his shots to give himself a chance of knocking out Spence or winning a decision. With Spence’s game plan emphasizing him throwing a load of punches in each round, it put Garcia in the position where he had to wait to land shots when Spence would stop throwing. It wasn’t a case of Garcia being able to throw shots in between Spence’s, because it was too risky. With Garcia not being a great counter puncher, he had to wait for Spence to stop throwing for him to and one of his hard shots. Garcia was able to hit Spence would come forward, as often he would forget to throw a jab before unleashing his powerful combinations. Garcia took advantage of this flaw in Spence’s game all night long, but he couldn’t land enough punches to keep him honest. “If you think Spence had problems getting guys to fight him before, he’s really going to have a problem now,” Ringstar promoter Richard Schaefer said to ESPN about Spence. If Spence can get the fight against WBA World welterweight champion Manny Pacquiao, his popularity could soar enough from that fight for him to be able to get the other top welterweights – Keith ‘One Time’ Thurman, Shawn Porter, Danny Garcia and Terence Crawford – to want to fight him. But based on how dominant Spence was in beating Mikey Garcia last Saturday night, he could have major problems getting the other top fighters at 147 to agree to face him. Pacquiao, 40, is a fearless warrior, and he wants to fight the best, because he knows those are the guys that are going to bring him the most attention for him to display his amazing boxing skills and talent. With that said, Pacquiao would obviously take a rematch with Floyd Mayweather Jr. in a second over a unification fight with Spence if Floyd offered him the opportunity. Since it’s not looking like Mayweather isn’t going to agree to fight Pacquiao in a rematch, then Spence is the next best thing out there for him. Thurman looked too shaky in his recent controversial win over Josesito Lopez last January for him to be a viable option for Manny. Likewise, World Boxing Council welterweight champion Shawn Porter looked even worse with his recent questionable 12 round split decision win over his WBC mandatory Yordenis Ugas on March 9. Fighting Porter would be a step backwards for Pacquiao. Spence took exception to some of the comments that commentators and so-called boxing experts had made in the media bout Garcia being too intelligent for him to beat him. They didn’t realize that Spence has a lot of different facets to his game that he can use to win his fights. In other words, Spence isn’t just a puncher like many people see him as. He can box if he wants to like Terence Crawford, which is what Spence showed in the first eight rounds last Saturday night against the 31-year-old Garcia. When Spence was boxing from the outside behind his jab, Mikey looked helpless to do anything against him other than wait for the rare occasions where he would go on the attack with his power shots. Spence said after the fight that he doesn’t see anyone in the welterweight division that can give him a fight, including Pacquiao and WBO champion Terence Crawford (34-0, 25 KOs). Crawford, 5’8″, is taller than the 5’6″ Mikey Garcia, and he’s a better counter puncher. The power is similar between the two. For Spence to beat Crawford, he would have to walk him down, trap and force him into a fight. Crawford is a mover, so he’s going to stand and fight Spence. However, Crawford wouldn’t be able to depend on his jab to beat Spence like he’s done throughout his career in facing smaller guys like 5’5″ Felix Diaz at light welterweight and Yuriorkis Gamboa at lightweight. Crawford would need to go to war with Spence, and that would be problem. Crawford doesn’t throw a lot of punches, and he would be in the same situation as Garcia was last Saturday night. Pacquiao says he wants the fight with Spence next. If the two can negotiate a deal, then we’re likely going to see a great unification fight between the two welterweight champions in the summer in July. That’s when Pacquiao says he wants to fight again. Spence said at the post-fight news conference that he’s ready and willing to return to the ring in July to face Pacquiao. Spence didn’t get hit much by Garcia, and got through the fight without suffering any cuts. 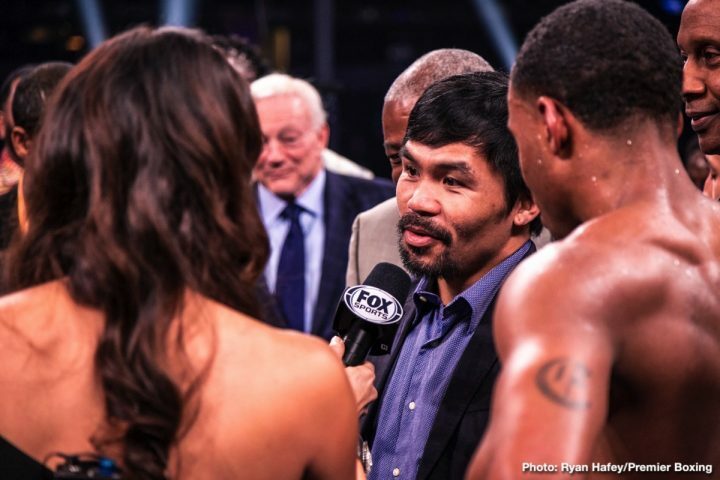 It shouldn’t be a problem for Spence to return to the ring in four months from now to face Pacquiao in a unification fight in July on Fox Sports pay-per-view or Showtime. A lot of boxing fans would be excited about seeing Spence and Pacquiao battle it out. The winner of the contest could face Keith ‘One Time’ Thurman in a unification or Crawford.